Large Durable Tools For The Little Carpenter In Your Life. Stuff Points: Earn 19 points when you buy this stuff. 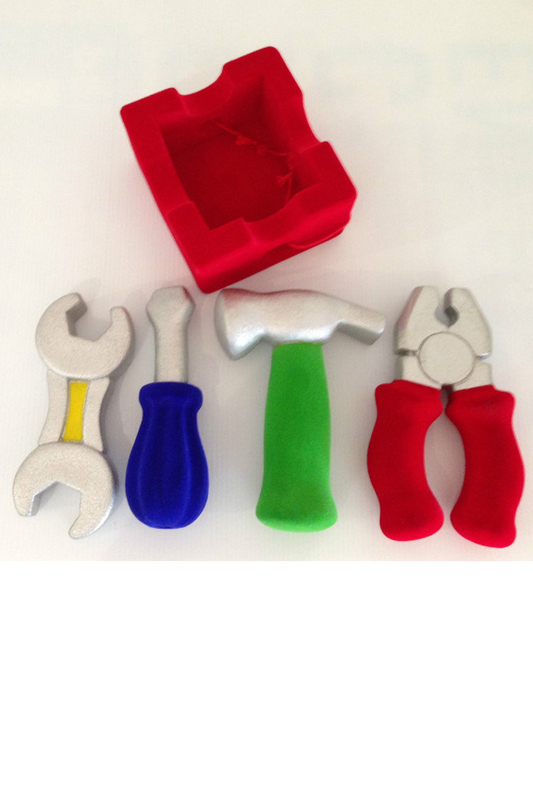 Prepare your little helper with this set of foam rubber tools. They'll get four essential pieces that look just like Mom or Dad's, and a handy storage box to keep them in. Unlike hard plastic versions that are easily damaged, quickly worn, difficult to handle, and painful if stepped on, this set is soft and squishy when gripped, bouncy when dropped, and durable enough to last for years. 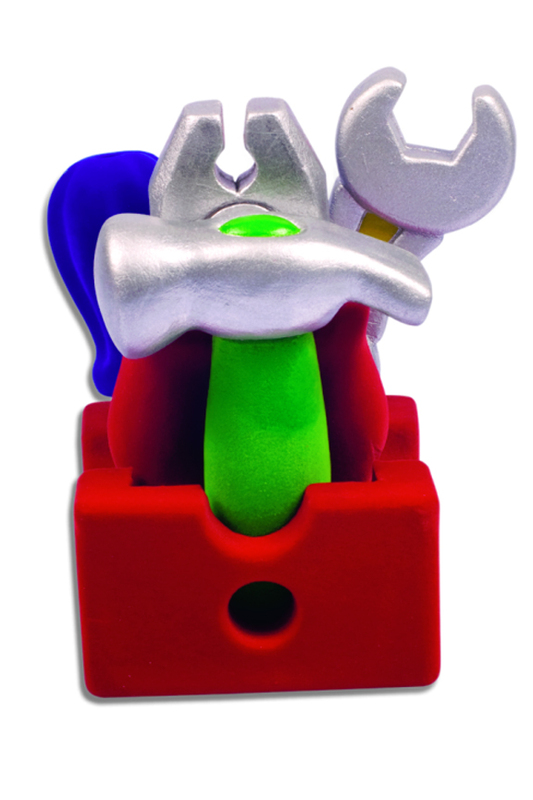 Each large tool is styled to look like the real thing, but made from 100% natural rubber. The dense inner material provides incredible strength, and makes them easy for small hands to hold onto, and the outer coating gives them a vibrant appearance and velvety soft texture. The oversize design makes them perfect for carpenters and mechanics just starting out, but usability will only increase with age. Durable construction allows kids to work hard without ruining the toy, and the forgiving rubber material ensures that they won't do any damage when trying to "fix" stuff around your home. Perfect for any budding DIY-er in your life, these tools are also biodegradable and eco-friendly, so you can feel good about giving them to your little handy man or woman. This four piece set actually includes five items. It's ideal for children of all ages, and it's usefulness will grow with them. This nearly indestructible set of foam rubber tools comes complete with four commonly used tools and one rubber box to keep them in. Dimensions 5" x 4.5" x 7"
Uses Perfect for little carpenters, DIY-ers and mechanics to work along side mom or dad. Large tools are perfect for babies, but usability increases as they get older. Texture Smooth on the "metal" parts. Super soft and kind of fuzzy on the handles and storage box. Squishiness Squishy when gripped, but firm and sturdy otherwise. Give your little handy man or woman the tools they need to tackle big jobs. 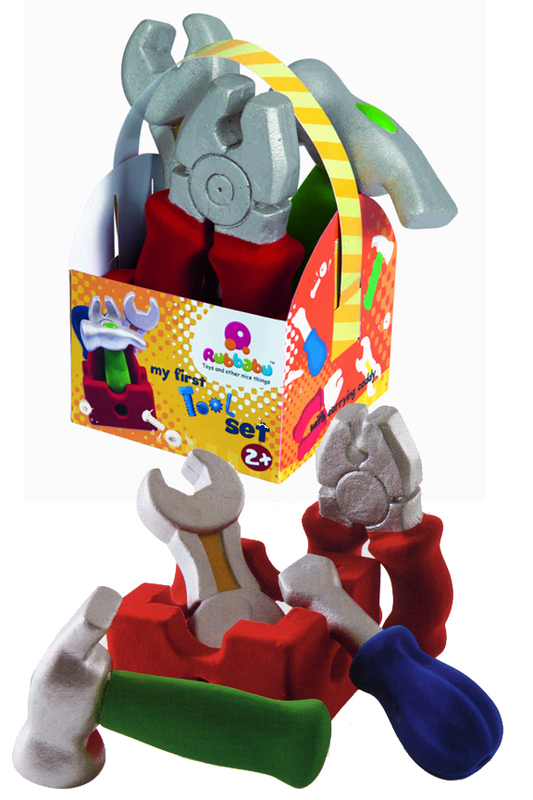 Easily gripped with durability to last for years, this set of tools is ideal for any child. Order Yours Today! Soft and Squishy Toy Cars Shaped Like Animals. Squishy Rubber Letters with a Uniquely Soft Texture. 9 Natural Rubber Building Blocks. Soft and Squishy With A Velvety Finish. Soft and Squishy Toy Cars Made From Natural Rubber. Squishy Toy Cars Shaped Like Animals. Made From Natural Rubber. Made From Natural Rubber For Safety And Durability.